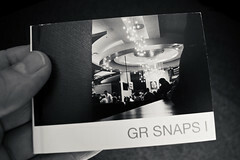 MyPublisher is giving away free My Mini photo books to the first 3000 that order with coupon code FREEMINI. Free shipping too. I also got a buy-one-get-one-free coupon code since I had to sign up for an account. The books are 3.5" x 2.75" and 20 pages. That's 21 photos total, you get one for the cover. According to MyPublisher, my book currently has a status of "Status: Received. Preparing to Print." Looking forward to seeing how the paper compares to Blurb. I totally ripped off that title from a book I was looking at this morning.